I got to thinking about Jay Hughes last night, and thought I'd write about what I know about him, and about what I don't know about him. James Jay Hughes was born on January 22, 1874 in Sacramento, CA, and died there on June 2, 1924. In the encyclopedias, he was listed as "Jim Hughes" though he was always know as "Jay." To this date we still don't have a height for him, though the encyclopedias list him with a weight of 185 pounds. Hughes was a very good pitcher from 1898 through 1904, winning 83 games in the majors and 59 in the PCL, plus his 1900 California League season: Starting in 1898 he's 23-12 (NL); 1899, 28- (NL); 1900, 24-10 (Cal); 1901, 17-12 (NL); 1902, 15-10 (NL); 1903, 34-15 (PCL); 1904, 26-18 (PCL). After that, I don't know what happened to him in 1905, then he pitches a single game for the San Francisco Seals on April 8, 1906, and the following season he pitches seven innings for the Seals in a losing effort. That's it, I have nothing more after that game. 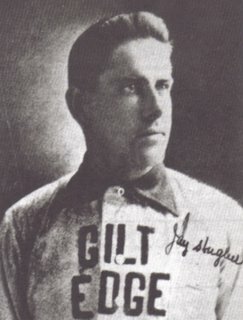 Jay Hughes didn't like pitching in the East, and refused to pitch for the Brooklyn club in 1900, and in 1903. 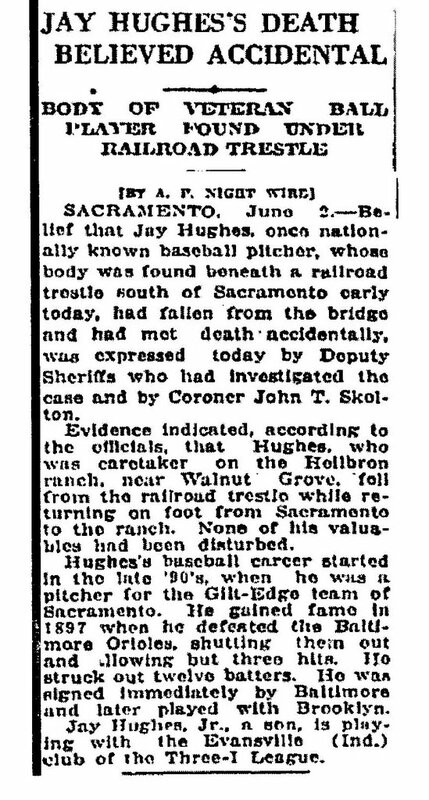 On both ocassions, the league he pitched in chose to become an outlaw league to keep Hughes pitching in his hometown. What I don't know is what he did after pitching for the Seals in 1906, and before and after his 5-23 start in 1907. He apparently didn't pitch in the California State League like his contemporary, Cack Henley. He might have pitched in the San Joaquin Valley or Sacramento Valley Leagues, but I have, as yet, not researched those leagues during the years in question. To me it sounds like Jay Hughes' death was that of a drinking man. Was that what caused his career to end so abruptly? I don't know, but I can't remember any mention of a drinking problem. 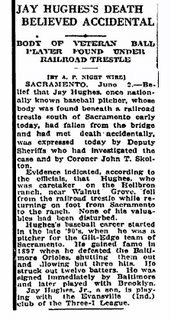 Additionally, the wire service article seems to indicate Hughes died in or around Walnut Grove, California rather than Sacramento. Walnut Grove lies some twenty-five miles south of Sacramento. Another change to the encyclopedias, I believe. One other note: In the above AP story, it mentions Jay Hughes, Jr. playing with Evansville. The son also had a tragic death: I belive he died in 1935, his playing career over in the depths of the Depression. Jay, Jr. drove over to where his estranged wife was living, parked his car, and blew his brains out. Fine story, Carlos, and a wonderful blog.